All transactions are safe and secure with a reliable history in online purchasing behind each of our associates. Buy the I Love Dexter t-shirt to own Dexter clothing and merchandise. If you wish you could have a man like Dexter, keep dreaming. This witty perfectionist serial killer only goes for damaged women like his girlfriend Rita Bennett (Julie Benz). Luckily for her, he is able to clean up some of her life's messes, including her abusive drug addict ex-husband Paul (Mark Pellegrino). 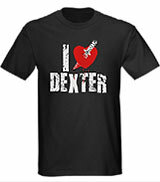 Show your love for Dex or the Showtime TV show itself with I Love Dexter t-shirts. Wear it to play with your Dexter board game and figures. In addition to the I Love Dexter tee above, browse the Dexter Clothing Gallery for more apparel like men's and women's clothes, kids shirts or hoodies.